HAPPY NEW YEAR!! And THANK YOU!! In response to my plea last week to help get us over the 600 mark on Facebook, we’re starting off the year with 604 Facebook fans of the show! THANK YOU for listening and for your support and encouragement through posts to the website and Facebook pages, email and memberships to KISL. 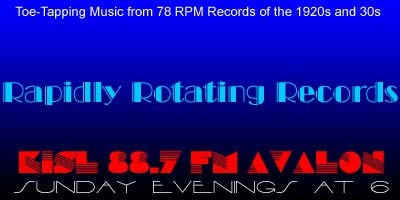 On this very first Rapidly Rotating Records show of 2017, we’ll celebrate the birthdays of Vincent Lopez, Jule Styne and Harry Smith. We’ll also have a set of “forever” songs. But because nothing lasts forever, unfortunately we’ll be celebrating the life and career of Rich Conaty who passed away last Friday. As most of you know, Rich was the host of “The Big “Broadcast” since 1973 on WFUV in New York. Sunday – Abe Lyman’s California Orchestra / Unidentified, v.
Just Love Me (That’s All) – Charles Kaley Orchestra / Charles Kaley, v.
Silver Head – Polla’s Clover Gardens Orchestra / Vernon Dalhart, v.
Forevermore – Jules Herbeveaux’s Orchestra / Frank Sylvano, v.